Searching for an Amish settlement? The Amish State Guide outlines Amish communities in 31 states, plus Canada and South America. Use the jump-links above, or simply scroll down for links to articles on Amish settlements in each state. Arkansas Amish-Few Amish live in Arkansas today, despite attempts at settling the state dating to the 1920s. Colorado Amish-Amish communities in the West are uncommon. But over the past decade Colorado has attracted a fair share of Amish pioneers. Today the Centennial State is home to 4 small Amish communities. Delaware Amish-A single Amish settlement is found outside state capital Dover. Though sizable, the Dover settlement has been losing Amish due to land and development pressures. Florida Amish–Part vacation destination, part southern Amish outpost, the unique Pinecraft community attracts a wide range of Plain people from across the country. Idaho Amish – The solitary Gem State Amish community dates to 2012. This small settlement lies near the town of Salmon (Lemhi County). Idaho was also home to a previous Amish settlement at Bonners Ferry in the early 2000s (full guide coming soon). Illinois Amish-The sizeable Amish community near the town of Arthur is by far the largest in Illinois. 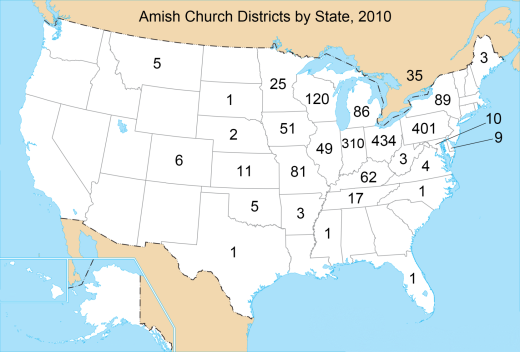 The rest of the approximately 20 Illinois Amish communities number only a few dozen households at most. The Illinois Amish population was the 10th-largest in North America as of 2010. Indiana Amish-The Hoosier State is home to America’s 3rd-largest Amish population. The Elkhart-Lagrange County community is by far the largest in the state. Other sizable Indiana Amish communities are found at Adams County, Nappanee, Allen County, and Daviess County. Around 2 dozen Amish settlements can be found across Indiana. Iowa Amish-Amish have lived in Iowa for over 160 years. Today, significant Amish communities are found at Kalona, Bloomfield, and in Buchanan County. A number of smaller Amish settlements are found across the Hawkeye State as well. Kansas Amish-Despite its 140-year history of Amish settlement, today only about 1,500 Amish call the Sunflower State home. Kansas is home to 3 communities over 100 years old (in Reno County and Anderson County), and a handful of settlements founded in the past 5 years. Kentucky Amish-Amish are found in over 30 communities in the Bluegrass State. Around 8,000 Amish are found in Kentucky, making it the state with the 8th-largest Amish population. Maine Amish-Maine’s 3 small Amish settlements are the only Amish presence in New England. Two communities are found in Aroostook County, and a third in Waldo County. Maryland Amish-Maryland’s 3 Amish communities are spread to the corners of the state. The St. Mary’s County settlement in southern Maryland is the largest, with a population of about 1,000 Amish. Michigan Amish-Michigan is home to North America’s 6th-largest Amish population. Sizeable communities are found in St. Joseph’s and Branch Counties among others. Michigan is home to nearly three dozen Amish settlements. Minnesota Amish-Minnesota’s 14 Amish settlements are concentrated in the southeast and central/northwest regions of the state. Amish first settled in the North Star State around the turn of the 20th century. The community near Harmony in Fillmore County is Minnesota’s largest, with approximately 1,000 Amish as of 2011. Mississippi Amish– Amish have only rarely settled the Deep South. Mississippi is home to a single small Amish settlement in Pontotoc County, the only Amish community in the region. Missouri Amish-The Missouri Amish population has grown rapidly thanks to migration from other states. Today there are over 9,000 Amish in Missouri, making it the state with the 7th-highest Amish population. Sizeable Amish communities are found at Seymour, Jamesport, and Clark. Montana Amish-Montana is home to 5 Amish communities, scattered across the state. The oldest Montana Amish settlement is found at Rexford in the northwest corner of the state. Rexford and the St. Ignatius settlements hold annual school auctions. Nebraska Amish-The Cornhusker State is home to a handful of Amish who’ve migrated into the state over the past decade. However “Nebraska Amish” more commonly refers to the ultraconservative Pennsylvania group, who take their name from connections with an early Nebraska Bishop and community (read more about PA Nebraska Amish). New York Amish-New York has been a popular destination for Amish in recent years, attracting much immigration from other states. New York is home to over 12,000 Amish today, making it the state with the 5th-largest Amish population. North Carolina Amish-North Carolina is home to a single Amish community today, but has a colorful history of Amish settlement. Ohio Amish-along with Pennsylvania, Ohio has the largest concentration of Amish anywhere in North America. The Holmes County Amish community is among the most diverse, with nearly a dozen distinct affiliations found in the settlement. Significant communities are also found at Geauga County, Ashland and Medina Counties, and Knox County. Oklahoma Amish-The Sooner State is home to 2 small Amish communities. The Chouteau Amish settlement is over 100 years old. Oklahoma’s other Amish settlement, at Clarita in Coal County, hosts a well-attended annual school auction. Pennsylvania Amish-The well-known Lancaster County community is the oldest in North America and one of the nation’s two largest Amish settlements. Besides Lancaster, large communities can be found at Big Valley, New Wilmington, and Smicksburg in Indiana County. Pennsylvania is home to over 50 Amish communities. South Dakota Amish-South Dakota became the newest addition to the Amish map in 2010, when a group of Amish from Wisconsin settled in Hutchinson County. Tennessee Amish-The Tennessee Amish population numbers over 2,000, spread over 6 settlements. The community at Ethridge is by far the biggest in the state, and one of the largest in the South. Texas Amish–Texas’ lone Amish community is found near Beeville in Bee County in the southern part of the state. However a number of Amish lived in Texas beginning in the early 1900s. More recently, a community existed near Stephenville in Central Texas. Vermont Amish – Vermont’s Northeast Kingdom is home to the state’s single Amish outpost, near Brownington. Amish settled this area in 2015. As of late 2018, Amish were scouting a second potential settlement location in the same part of the state (full guide coming soon). Virginia Amish-Though Amish first settled here in the late 1800s, Virginia’s Amish population remains low today. The Old Dominion state is home to 4 small Amish settlements. West Virginia Amish-The Mountain State has been largely overlooked by Amish. Today only three small settlements are found in West Virginia. Wisconsin Amish-Wisconsin is America’s #4 Amish state, with an Amish population of over 15,000. Significant settlements are found at Cashton, Wilton/Tomah, Hillsboro, and the Kingston/Dalton area, among others. Clark County in the central part of the state is home to 5 separate Amish communities. Wyoming Amish – Another fairly recent addition to the list, Wyoming saw Amish settle its northeast corner (the Hulett area of Crook County) in 2011. This is the only Amish community in the Equality State (full guide coming soon). Canada Amish – Amish have lived in Canada since the 1800s. Today the country is home to a 5,000-strong Amish community, mainly in Ontario. Small settlements are also found in New Brunswick, Prince Edward Island, and Manitoba. South America Amish – The remarkable situation of Amish settlements located in Bolivia and Argentina came to fruition in 2015. Pre-existing communities of Old Colony Mennonites, a related Anabaptist people, affiliated with Amish in North America that year. Today each country is home to a single small community. Amish had previously settled in Latin America in a handful of instances (including in Paraguay), though none of those communities have survived (full guide coming soon). For additional Amish population information, see the Young Center Amish studies web site.